Research reveals the positive impact of drama on a student's physical, social, emotional, and cognitive development. Click here for data. sister is forced to face “the crimes of the heart” she has committed. Lenny Magrath, the oldest sister who tries to keep the family reputation intact, will be played by Tana Clay.She last appeared in Cats and Bye Birdie at MLT. be portrayed by Holley Speed.Holley makes her return to the MLT stage after a long absence having last appeared in Grease. Babe Botrelle, the youngest of the girls, went to Chandler Giles.She has been seen in several MLT productions including A Christmas Carol, Oklahoma and Wizard of Oz at MCC. The role of the young lawyer, Barnette Lloyd, who will defend Babe, is played by Colton Tinsley.Colton has done several MLT shows including Best Little Whorehouse in Texas, Footloose, Cats, and Bye Bye Birdie. played by Stella McMahan.This is her first role at MLT but she has done makeup for the theatre for several years. The role of Doc Porter, Meg’s old boyfriend, went to Brian H. Smith. Brian is a newcomer to the MLT stage but brings experience from appearances most recently in Moon Over Buffalo and Company at the Shreveport Little Theatre. Ronnie Miller will direct the show.Josh Myers will serve as Stage Manager, Scott Merrill is the Technical Director and Shannon Culpepper will be in charge of Lighting. 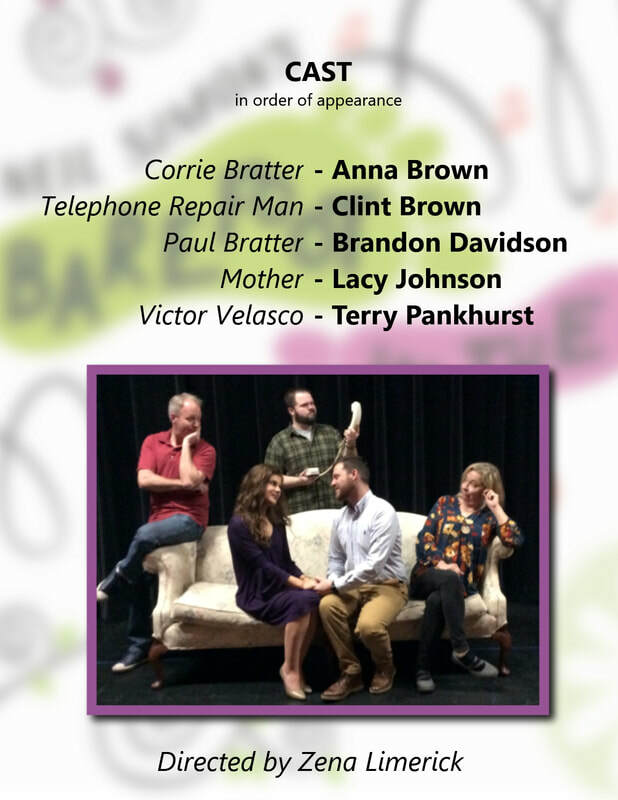 Roles for the award winning melodramatic thriller, Wait Until Dark by Frederick Knott, have been cast for the upcoming February production at MLT. The lead role of the blind heroine, Susy Hendrix, who becomes trapped in a suspenseful situation with three deadly criminals, went to Kim Knight. Kim’s first role on the MLT’s stage was in the season opener, Legally Blonde. Mike Talman, the smooth talking thief who poses as an old friend of Susy’s husband, will be played by Scott Causey. Scott has been in numerous shows at MLT including Best Little Whorehouse in Texas, Cat on a Hot Tin Roof and Bye Bye Birdie. The part of the villainous sociopath, Harry Roat, Jr went to MLT newcomer Jami Pittman. Jami was in several roles in high school. He won a Best Supporting Actor Award in The Walter Trumbauer Secondary Theatre Festival in Alabama in The Grapes of Wrath. Veteran MLT actor Brad Hampton won the role of would- be criminal mastermind, Sgt. Carlino. Brad has been in several MLT plays such as The Foreigner, Streetcar Named Desire, A Christmas Carol and 42ndStreet. The part of Gloria, the young girl who lives in the apartment house upstairs and helps Susy outwit the criminals will be acted by Sarah Page Sikes. Sarah has appeared in Les Miserables, Annie and The Best Christmas Pageant Ever. Another MLT stage newcomer is Sam Dabit. Sam will play Susy’s husband. He is owner of Sam’s Fashions in Meridian. Rounding out the cast as two N.Y cops are Jarred Armstrong and Tom Fair. Both have appeared in various plays at MLT, MCC and Stage Two. “The Casting Committee had a difficult time with these auditions. Several talented performers tried out and we had to make several tough choices. I like the mixture of veterans and newcomers. In the long run, it will make for a great show and continue to bring to the MLT stage a variety of community people,”said MLT Director Ronnie Miller. Carol Sue Wiggins will serve as the Stage Manager. 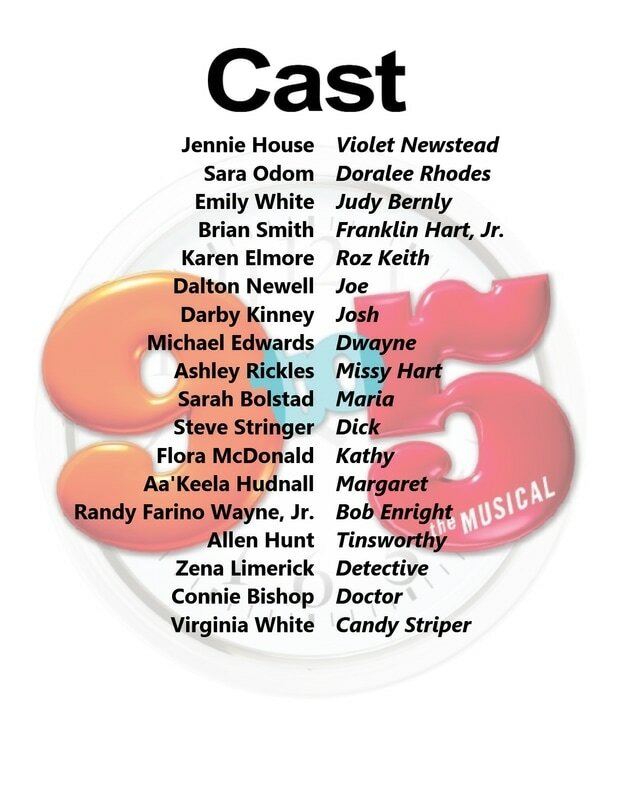 MLT proudly announces its cast for the 2013-14 season finale, Anything Goes. This upbeat musical/comedy with words and music by Cole Porter is set in the 1930’s. The plot concerns Billy Crocker who stows away on the S. S. America, an ocean liner bound from New York to London, so he can dissuade Hope Harcourt not to marry an aristocratic Englishman, Sir Evelyn Oakleigh. Crocker has boarded without a ticket and is forced to adopt several disguises so he can accomplish his mission of stopping the marriage. He is aided by the Rev. Dr. Moon whom the FBI has branded as “Public Enemy #13 and his “doll” Bonnie Latour. Hope eventually discovers she has become an heiress, drops Sir Evelyn and consents to marry Billy. Sir Evelyn turns his attention to Reno Sweeney, an evangelist turned nightclub singer and all ends well. Show dates are May 8-14. 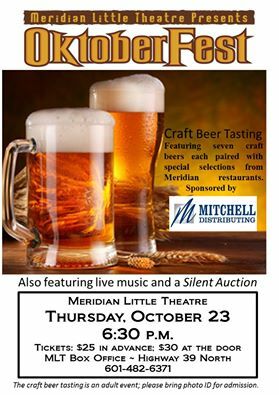 For ticket information call MLT at 601-482-6371. 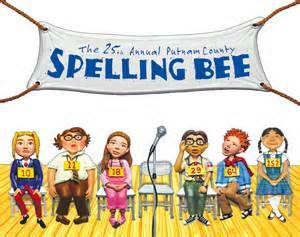 “The 25th Annual Putnam County Spelling Bee”! CenterStage hosted its annual summer youth workshop for kindergarten through 6th grade children. Forty participants enjoyed this five day workshop, which included all proponents of theater, including lighting, staging, art, dance and acting. In addition, this summer we concentrated on the importance of re-purposing existing props and art supplies while still turning out a quality staged product. The students enjoyed the fun of improvisation led by one of Meridian's most gifted "improvisers," Scott Farmer, with fabulous art direction by Lauderdale County School Art instructor Melinda Perry, and choreography handled by Artistic Director Warren Friedman. Carol Sue Wiggins, CenterStage Chairman, with the help of Sidney Covington, took the lead in making sure another wonderful summer workshop came off without a hitch. These children are now ready for CenterStage's upcoming winter production of "The Emperor's New Clothes." 2014 Summer workshops soon to be announced!!! What an unbelievable time everyone had. Enjoy the photos from Summer workshop 2013!! Monday, Oct 20 3:30 - 5:30 pm. The Meridian Little Theatre announces auditions for the timeless musical, Irving Berlin’s White Christmas on October 20 and 21 at 6:30 p.m. The play is based on the 1954 film classic about two World War II vets that have become partners in a song-and-dance act after the war. Looking for love, they follow a duo of beautiful singing sisters to a gig at a Vermont lodge, which happens to be owned by their former army commander General Waverly. Performances are December 11-17! Bob Wallace - late 20's to mid 30's, a superb singer with a crooning baritone style who moves well. General Henry Waverly - late 50's to mid 60's, retired general whose curmudgeonly military exterior covers his warmth and compassion, with the exception of one line, a non-singing role. Those auditioning should be prepared to sing a 30 – 40 second song from the show or from a well- known show tune. A piano accompanist will be available. Bring your own sheet music if not from White Christmas. There will be scene reading auditions from the script, plus dance auditions. For more information, call MLT at 601-482-6371. Dave and the Sweethearts- Caleb Landrum, Conner Williams, & TBA. 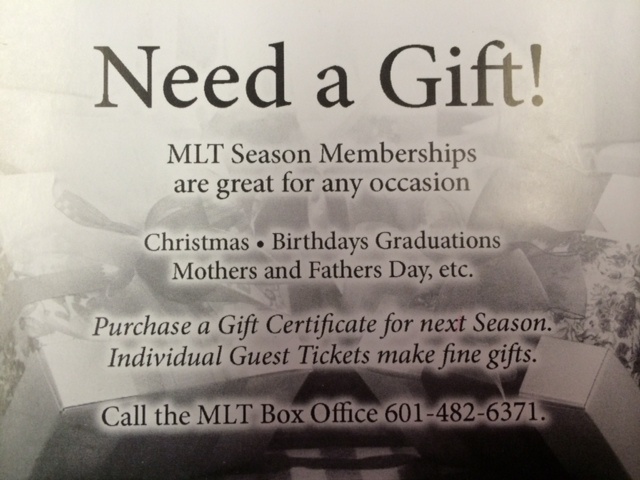 The MLT Guild will hold an open house for new membership on August 9, 2015 (2:00-4:00 pm) here at the theatre. Come out and see what our playhouse has to offer. Light refreshments will be served. 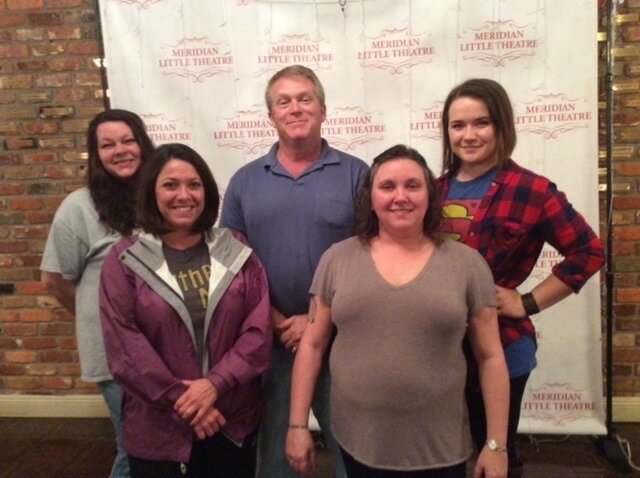 A new play performed by a cast of Mississippi Veterans and military families written from their own experiences. Performances at MLT Friday, August 14 & Saturday, August 15 at 7:30 pm and Sunday, August 16 at 2:00 pm.